Ireland all-rounder Alex Cusack has announced his retirement from international cricket after suffering a series of injuries. 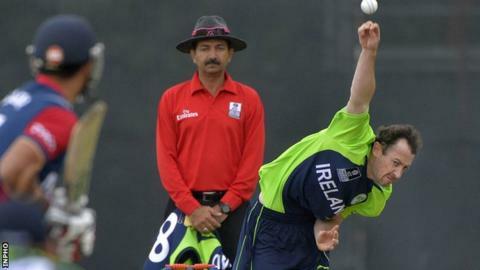 The 34-year-old, who made his Ireland debut in 2007, took 180 wickets and scored 2,347 runs in 174 games. "I have been thinking about it seriously for a year, especially with the bad run of injuries I have suffered in recent times," said Cusack. "Those injuries have taken a considerable toll on my body." Cusack had originally planned to retire following the World Cup earlier this year, but delayed his decision until he helped Ireland successfully qualify for the ICC World Twenty20 in India in 2016. He added: "I'm also the father of three young children, and I feel I need to be around more for them." Cusack has enjoyed many highlights during his eight-year career with Ireland. He made 47 during a stand of 161 with Kevin O'Brien in the World Cup win over England in Bangalore in 2011 and also took 4-32 as Ireland edged out Zimbabwe by five runs in Hobart during the 2015 World Cup. His only century, a fine 130 in 2007 against Scotland, came during a stand of 234 with Andre Botha - the third-highest partnership for Ireland in all forms of the game. Often at his best in T20 cricket, Cusack was named the Player of the Tournament at the 2010 ICC World Twenty20 Qualifying tournament in the UAE.